In 1999, Capt Frederick Ill, Jr. made front page news when he leapt down into the subway tracks to rescue a man whose legs had been severed when he was pushed in front of a train. Less well know is that he watched over the man’s rehabilitation and found scholarships for his children. Stories place Capt. Ill around the 17th floor of the North Tower. Told to evacuate, he said “Let me get my guys first.” His guys were the six other men of Ladder Co. 2 who perished in the North Tower with him. 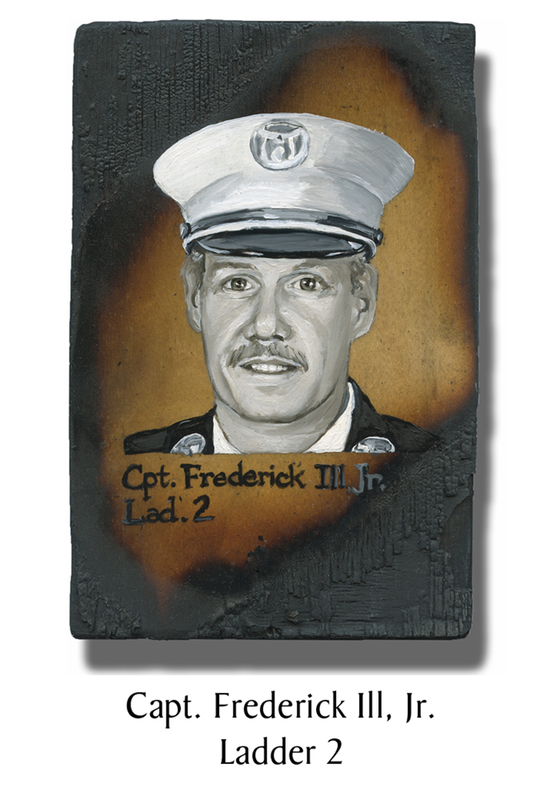 This entry was posted in Uncategorized and tagged 343, 9/11, better angels, Dawn Siebel, FDNY, firefighter, firefighters, firefighters of 9/11, Frederick Ill, Ladder Co. 2, LODD, Manhattan, memorial, NFFF, paintings, portraits, World Trade Center, WTC. Bookmark the permalink.